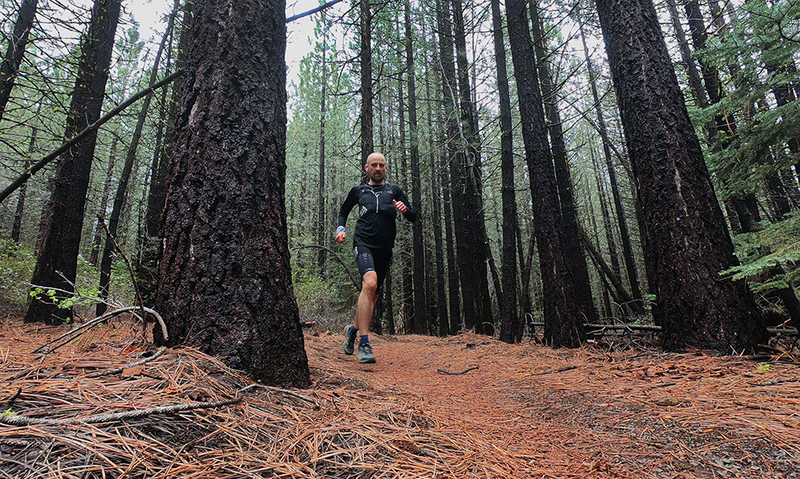 We caught up with pro-ultrarunner and Topo elite athlete, Paul Giblin, during his training for the Western States 100 as he attempts (for the third consecutive year) to elevate his finisher status from top-10 to the coveted top-3. Today, Paul dives into how Topo has served him well on the notorious terrain found on the Western States 100 (WS100) course. We also tapped Topo founder, Tony Post, for a behind-the-scenes look at the design process when creating a trail shoe equipped to take on the world’s toughest ultras and a sneak peek at the new models launching this fall. I must have run the WS100 in my head a hundred times by now – reliving every step and every misstep over the years. It begins with the start line in Squaw Valley California on the famous ski slopes of the Lake Tahoe resort (the site of the 1960 Winter Olympics). The race starts at over 6,000 ft. with the first 4 miles going straight up to Emigrant Pass at 8,750 ft. From there it crosses into Granite Chief Wilderness and the heart of California’s historic Gold Country, passing through canyons and rough single-track trails en-route to the finish line in Auburn. From snow in the high country to extreme heat in the canyons, the race is physically demanding and always unpredictable. The terrain demands a shoe that will give your feet enough protection from sharp rocks on long descents, but light enough to allow you to climb well out of the canyons, and is breathable enough to manage the heat and water crossings. When I first ran this race in 2016, I sported the MT-2s. They were a great racing shoe: lightweight with that unique Topo natural fit. Together, we crossed the finish line in 5thplace. 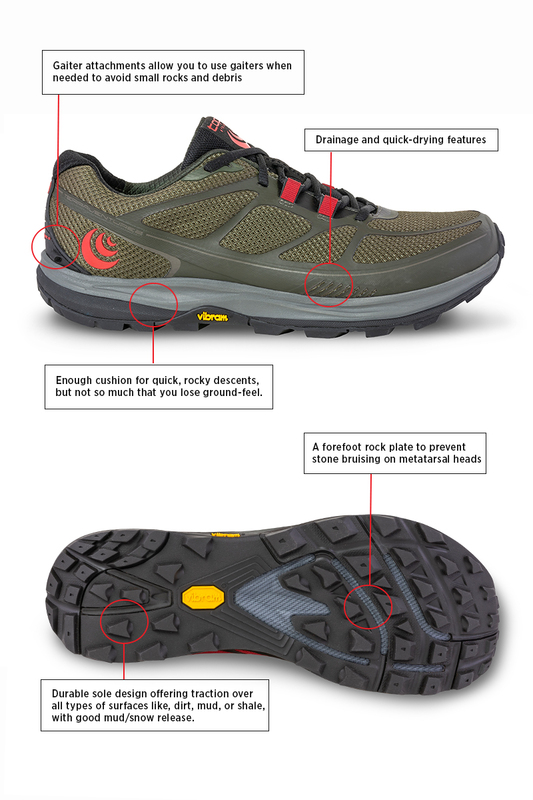 Last year, I switched to the more rugged platform found on the Terraventures. A lot of the course is rocky underfoot, particularly in some of the Wilderness areas and Canyons section. The Terraventures – with the forefoot rockplate and extra grip—really helped to protect my feet and provided good traction on the long descents. After last year’s race, Tony and I took some time to discuss the Terraventure in the context of my performance and he asked if there was anything more I would want if I could “dream” up the perfect shoe for this race. I told him that I wished there was a shoe that functioned like a hybrid of the MT-2 and Terraventure: super-responsive and light but with enough protection to handle some of the more extreme terrain on course. Then, the Runventure 2 was released; I LOVED testing them out during the 100 miles of Istria race this spring, which is also a rocky course (editor’s note: Paul took first place at this race!). I knew after that race that the Runventure 2s checked all the boxes for my dream shoe and could help me have a really great race at WS100 this year. It is an honor working with the elite athletes on our team striving to reach the pinnacle of their sport. Every ultrarunner knows that the WS100 is one of the holy grails of trail races and only the most thoughtful shoe designs live to tell the tale of surviving that course. 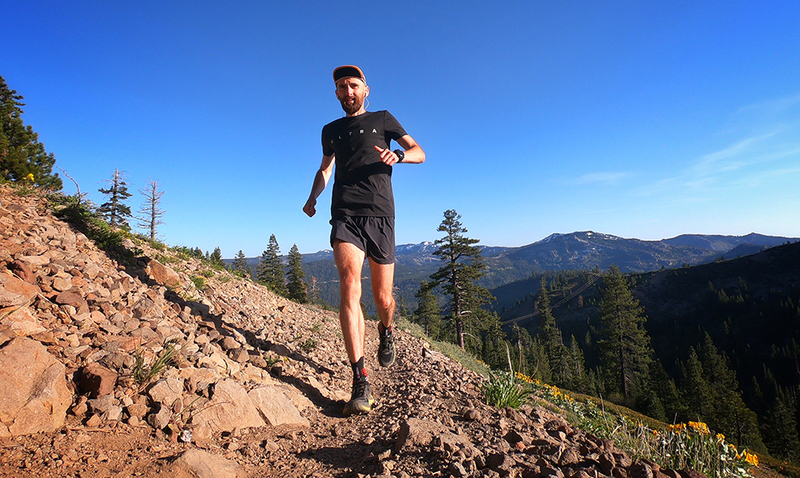 It’s somewhat of a dream to be designing shoes for the ultimate trail runner, especially one like Paul, who is taking on the WS100 event for the third consecutive year. My trail shoe designs also stem from the fact that my heart has always been in the mountains – having spent my childhood in the Colorado mountains skiing, hiking, running and biking. I also experienced trail-running history when I was the head of marketing and product at The Rockport Company in the early/mid 90’s. We made a lot of great lightweight trail product and sponsored the Leadville Trail 100 before anyone had ever heard of it, 15 years before Born to Run was published. Leadville was a regular testing ground for our trail ideas at Rockport back then. Also around that same time, I traveled regularly to Montebelluna, Italy, where I learned about boot making in factories that had been making rugged soles for generations. Those Leadville and Italy experiences came together as we created some very innovative light-hiking and trail running products. We even made a Vibram-bottom running sandal called the Tarahumara during the mid-nineties – it was the first commercial trail running sandal. After Rockport, I went on to become CEO of Vibram USA for 11 years. There, we had the privilege to work with lots of great companies and mountain athletes. I was inspired by our team’s ability to constantly innovate ideas in traction, material composition, and design. So far, we feel pretty good about bringing this vision to life in our current product line. Our fans have responded very well to our protective, but responsive platforms that let your body move more naturally. We also often hear that our soles wear very well – we’re glad that it’s usually one of the last parts to wear out on our shoes! Anyone that knows me knows that I am a glutton for feedback and lately we’ve been fielding requests for models with a Vibram sole, more drainage to help the shoes dry more quickly, and accessories like super lightweight gaiters that help you get the most out of our shoes. With the launch of Topo’s newest trail program coming later this fall, you’ll see a lot of these customer requests materialize. We wanted to work with the best component companies available, Vibram soles, Ortholite footbeds, eVent waterproofing … all combined with some of Topo’s unique ideas around fit, seamless construction, and responsive multi-density midsoles. Many of our athletes will be testing these products over the summer, helping Topo refine the features and performance characteristics. We can’t wait to share Terraventure 2, Hydroventure 2, and the all-new Ultraventure starting this November!